This picture is why I run in the mornings. I grabbed this shot of Oxford's River Isis, which is the part of the Thames that runs through the university town, a few years ago while studying there. 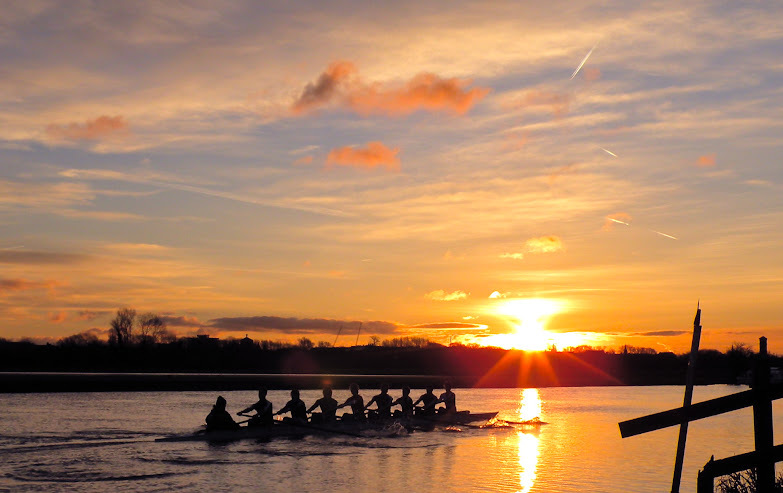 These intrepid Oxford rowers were braving the chilly morning for a chance to practice on the nearly-empty water. Morning exercisers are more likely to actually work out than late-day athletes. For me, working out in the morning means getting it out of the way. I can rest on my laurels the rest of the day. Best of all: I don’t have to worry about fitting in time after work. That being said, pretty much all evidence indicates that working out in the afternoon is more beneficial than working out in the morning. Interestingly, most running world records have been set during afternoon competitions. However, morning athletes at far more likely to actually do their workouts than afternoon athletes. To me, that’s more important than the marginal gains to speed and efficiency. I work out in the morning because I like the consistency. I won’t be interrupted by other obligations that might pop up during the day. No matter what happened the day before, I’ll always have my run in the morning. It’s a chance to start over, and start fresh. If you’re an elite athlete for whom small percentage gains will make or break your performance, work out in the afternoon. If you’re like me, and you aren’t about to break any world records, you can pretty much work out whenever you want to. Takeaway: For those interested in improving performance, afternoon workouts are best. For those interested in actually getting their workouts done, morning workouts take the cake. Do you prefer morning or afternoon workouts? Why? This entry was tagged health, motivation, no excuses, running, training. Bookmark the permalink. I couldn’t agree more! If I don’t workout in the morning I know that it is highly likely that it just won’t happen. Although getting up early can be tough (especially when it’s cold and raining) it sets me up for the rest of the day. And I know that if the rest of the day does not go my way, I have at least achieved one of my goals for the day. An early morning run also allows me to see the world wake up – the sun rising over the city and lights coming on in office buildings and homes – it can be a pretty spectacular – I agree with you – sunrises are gorgeous. Your post inspired me to commit to early morning workouts – let’s face it I’m not an elite athlete and I just want to get my workout done. Writing this from a Sydney morning, I currently have that uniquely awesome feeling of knowing I’ve already worked up a sweat, earned my breakfast and now have the luxury of trolling blogs before my colleagues join me at work. It’s a great feeling – thank you!